DOCTOR WHO: The TV Movie - Gravely Misrepresented | Warped Factor - Words in the Key of Geek. In our look back at each Doctor's debut adventure we reach the short lived television era of the Eighth. Dominic Fellows revisits 'The TV Movie' aka The Enemy Within, and reassesses a common belief regarding the story. 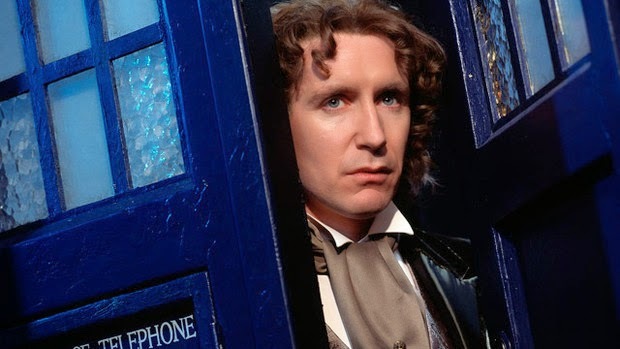 January 1996 - Paul McGann is the Doctor! I had no idea who he was, but he was young looking and as a kid about to turn twelve that was really appealing to me. ‘What! That’s a whole week! Why have they put it back? I have to wait even longer!’ It was shortly after the Dunblane tragedy so anything with guns immediately became taboo and so the film had to be delayed and edited. Looking back I’m utterly ashamed of my reaction, but it should have said something about the tone of the film. For this was the only time in the show’s history that an episode had to be delayed because it touched upon devastating real-world events. This wasn’t family viewing anymore. One week later, the rest of the family are, for once, interested to see it and so offer no resistance when I request we have it on in the living room with a takeaway. And what a movie! I loved and still love that film. I was twelve and, possessing no real critical prowess or objectivity, I could not comprehend that it would fail. But fail it did, at least that is the perception. I remember DWM running an article speculating on the future of Doctor Who called ‘The Mourning After...’ which pretty much summed up the feeling of fans for the remainder of 1996. We all lived in a state of hangover for about six months until January came round again and it was all lamentably clear that ‘The Movie’ was just a one night stand. One great night of fun and excitement, but all over too quickly, leaving a very bittersweet memory. But is that really true? Are our perceptions accurate or have we just come to accept them as such having believed a falsehood for so long? I’d like to dispel a popular myth right now. The long held belief is that ‘The Movie’ was intended as a pilot and if it was successful a series would be picked up. Writing in his 2000 book ‘Regeneration’ Philip Segal revealed that although he was guilty of perpetuating this notion it is, in fact, utterly untrue. He had lobbied to make a series ever since 1987 (which was, fact fans, partly responsible for the shows cancellation and dropping of ‘The Dark Dimension’) and after years of trying he finally got it backed as ‘The Fox Tuesday Night Movie’. How many ‘Fox Tuesday Night Movies’ have ever been picked up as a series? Honestly I have no idea but I’m going to hazard a guess and say none whatsoever. This is because, as the name implies, they are not meant to be series, but essentially an anthology in itself and a means of making movies on a TV budget. The more than likely truth is that even if ‘The Movie’ had been the most successful thing in the history of American television, it’s still highly unlikely that any network would have even considered the remote possibility that they may one day entertain the notion of maybe making a series of Doctor Who. Before forgetting about it entirely and running a repeat. The only chance it ever had was if every other show on the network at that time and in the right slot had completely fallen through and there weren’t even repeats to fill said slot, the networks may have looked to their TV movies for inspiration, but then they still probably would have changed it massively. As an aside note, circumstances similar to these is how ‘Buffy the Vampire Slayer’ managed to get commissioned the same year (another story for another time). Tonally it’s not so different from ‘The Movie’; Anthony Stewart Head’s Giles is not a million miles from the Eighth Doctor and Russell T. Davies often cited ‘Buffy’ as a major inspiration for revived Doctor Who. 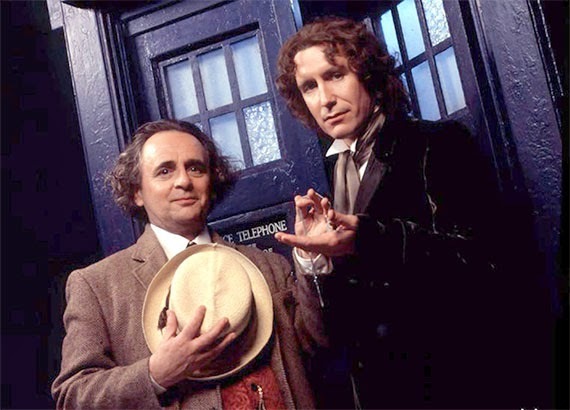 In fact, running exactly between 1996 and 2004 it’s quite a good substitute for Doctor Who, at least it was for me and Mr. Davies it seems. And looking back it’s a terrible pilot. Ordinarily, a pilot would attempt to answer the following questions for a new audience ‘What’s a Skaro?’ ‘Who’s a Gallifrey?’ ‘Why is there a blue phone booth in space and what has it got to do with that old bloke in a castle?’ All these elements, which take place within the first minute really do require a prior knowledge of Doctor Who that goes beyond a simple backstory. But as a fan who even then, knew more than the basics of the show I found this thrilling and thanks to the intervening years and a prime example of how it should have been done in ‘Rose’ I have come to look on it more like a greatest-hits-finale to the classic series of Doctor Who, ticking all the boxes – Master, Prydonian Seal, Eye of Harmony, regeneration, ‘death’ of The Master, Daleks, Gallifrey, Skaro, multiple Doctors (of sorts) as well as adding some new elements into the mix such as big set pieces, orchestral score and a kiss. And viewed as such it's one hell of a finale! First off there’s Sylvester McCoy. At the time it seemed unthinkable that he wouldn’t reprise the role for a regeneration, with hindsight, it’s exactly what shouldn’t have happened and yet wonderfully paradoxically (This is Doctor Who after all) it’s a good thing it did. 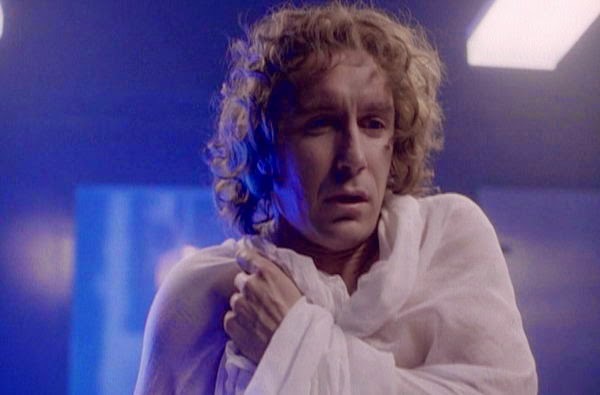 It’s Sylvester McCoy’s presence that legitimises ‘The Movie’ and therefore Paul McGann’s Doctor. 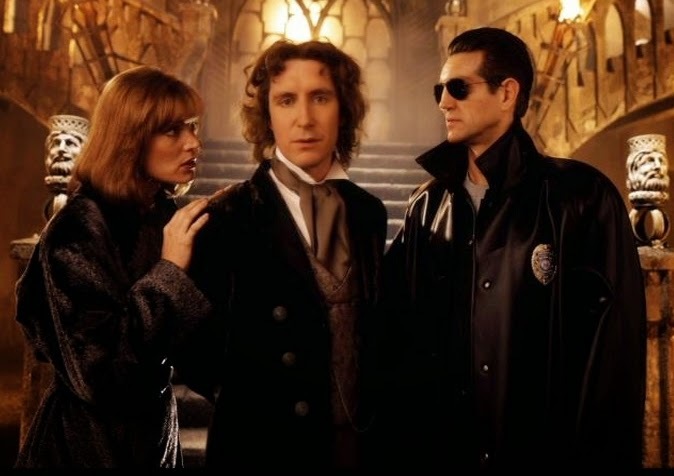 Had he not appeared I think the Movie would have been quickly dismissed as ‘that American version’ and in turn been paid as much attention as ‘Dr Who and the Daleks’ or ‘Scream of the Shalka’ but his presence makes this 100% official and that makes McGann official and we have been blessed indeed with the multitude of expanded universe material produced because of it. The comic strip seemed to get a new lease of life, the novels were completely re-booted and best of all Big Finish were able to claim a Doctor as their own. For me, Doctor Who did not return in 2005 with ‘Rose’ but in 2001 with ‘Storm Warning’, does it really matter that we can’t see it? It was an ongoing series of Doctor Who featuring an essentially still new Doctor. It all started with this one film. 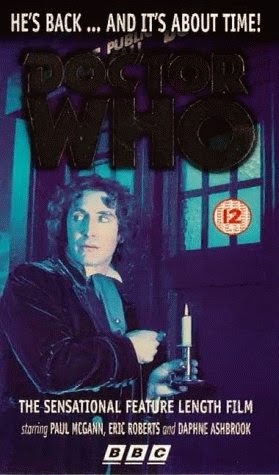 And of course there’s McGann who, much to my dismay usually comes very low in any ‘favourite Doctor’ poll. I don’t think this has anything to do with a general disdain for McGann but more to do with fairness due to the brevity of his tenure it just doesn’t seem right to place him above say, Tom Baker, Tennant or Smith despite him being arguably the better actor. Although if you compare his performance in ‘The Movie’ to any of his predecessors/successors first day on the job it’s probably only Troughton that trumps him. I’d like to say a word for Eric Roberts too. Everyone sneers about him but I rather like his Master. When Roger Delgado said ‘He’s the man fans love to hate’ he could have been speaking of any of his successors. Over the years I’ve heard things like ‘far too evil, too over-the-top’ or ‘not evil enough, too campy’ attributed to all of Delgado’s successors, but for some reason Roberts is the one that seems to stick in people’s craw. I suppose it’s because he adds a sense of ‘Hollywood’ to things, which in turn perpetuates the myth of ‘Americanisation’ which is what many object to in this film. I would argue that it is not so much ‘Americanised’ as ‘modernised’. Let’s not forget that Doctor Who was seen as antiquated in 1989 and in 1996 modernisation was seen as the way forward. This was glossy Doctor Who with tight editing and a cinematic look, so not too dissimilar to how the show is now. And so for years it has been deemed a failure. To which I say how many one-off episodes of Doctor Who have there been that inspired a new direction for the established comic strips, books and later on audio? How many have there been that have left fans so hungry for more that they took the lead actor into their hearts and created stories for him by any means necessary? As a direct consequence of this one film, we got a lease of adventures that were all new, all different and all at once. There was no ‘gap’, the stories were just told in a different way. We all thought we were hard done by in the mid-late nineties. I’d say we were spoilt. Not bad going for a supposed failure.